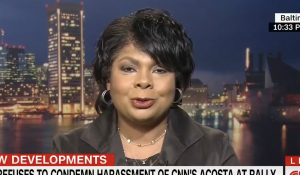 CNN political analyst April Ryan claimed Jim Acosta's life was in "jeopardy" at a Donald Trump rally this week, criticizing the fact that White House press secretary Sarah Huckabee Sanders gets Secret Service protection. Ryan, like Acosta, frequently opines on CNN about her acrimonious interactions with Sanders and the Trump administration. Acosta was heckled and flipped off while reporting at Trump's rally in Florida, and he and Sanders later had a bitter interaction over Trump's attacks on the "fake news" media being the "enemy of the people." "Jim Acosta's life, in my opinion, was in jeopardy that night. There was a safety issue," Ryan said in an interview with liberal primetime host Don Lemon. "And, you know, she gets run out of a hen house [the Red Hen restaurant] a couple of weeks ago and gets Secret Service detail." "We don't have Secret Service detail," Lemon mumbled, in a clip flagged by NewsBusters. Ryan went on to say Trump had "stoked the flames" to put reporters' lives in jeopardy at his rallies. "She gets taxpayer-funded security for something that she stokes. But yet, it's OK. It's freedom of speech for us," she said. "It is not right." Ryan talked about how she sparred with George W. Bush spokesman Ari Fleischer and "even Robert Gibbs," Barack Obama's first press secretary, but it was "never personal." "This has now gone beyond politics. This has gone into life. This has gone into changing lives," she said. Lemon added they didn't "begrudge" Sanders getting security.